Sometimes, it is important to mark cells that have some specific values. Most often, users need to differently mark negative and positive values. In this article, we will see how to make negative numbers red in Excel. Negative numbers can be made red in Excel in three ways. You can use conditional formatting – the most used approach. 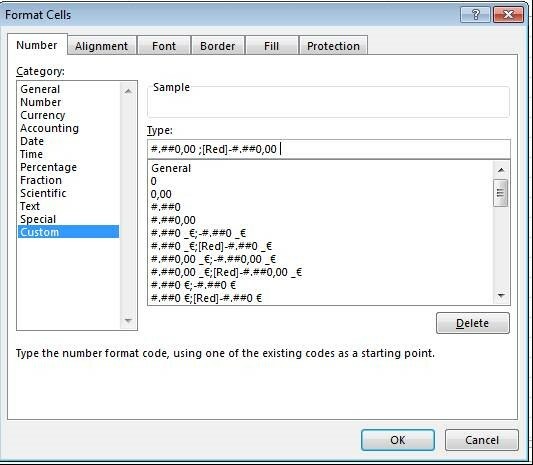 You can also use Built-In Formatting System (Format Cells dialog box) and Custom Number Formats. So, let’s start with the first one. We do not need some complex Excel file to show how this is done. Just open Excel and type in some values (make sure to have positive and negative ones). I created a table like this (you don’t have to do the formatting things). How to perform conditional formatting? Select values where you want to apply the formatting and click the triangle in the Conditional Formatting, in Home tab. Click on “New Rule”. 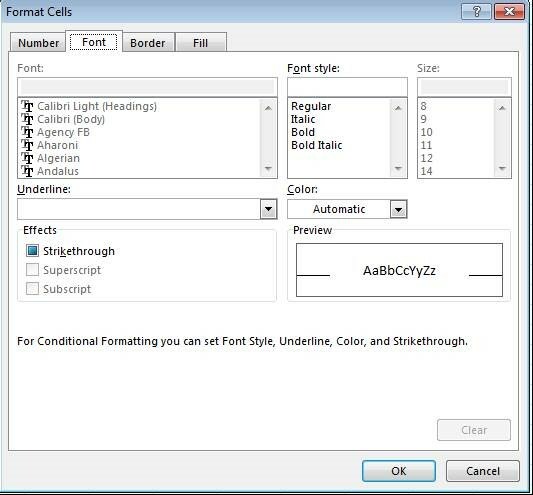 This can be done in so many ways, but I will show you the most flexible way that you can use – defining a formula for the rule, so you can apply that for any other formatting that you need. 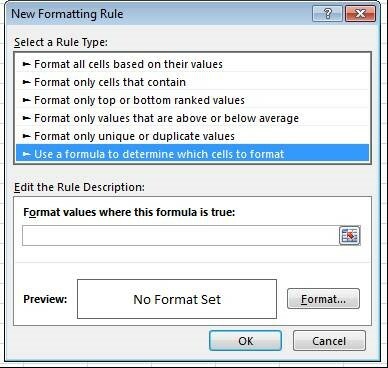 Select the last option – “Use a formula to determine which cells to format”. In the field for the formula, in this case, I typed =A3<0. 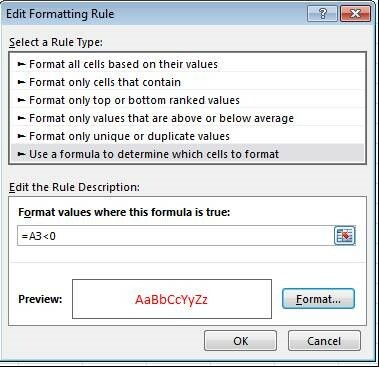 It means that if A3 or the current cell is greater than 0, it will be formatted in a defined way. 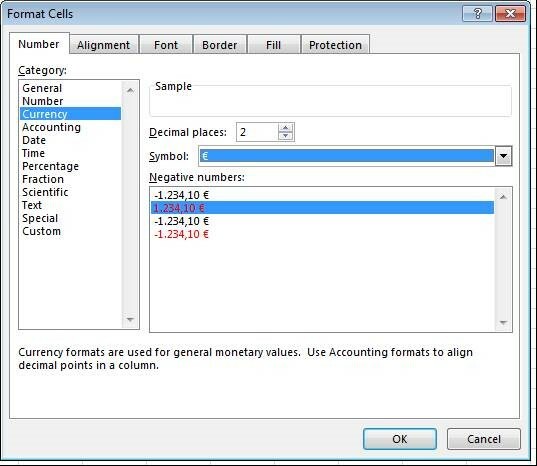 The formula without a $ symbol will work on any cell if you apply to some wider range. If you add $ signs in certain places, it works according to rules for absolute and relative references. To define the format when the rule is “True”, click on “Format”. Press “OK”. You will get a screen like this: In the “Applies to” field, you can select cells where you want to apply the rule. “Stop if true” mark should be checked if you want the rule to stop working once the condition says “True”. If you want this condition to keep working if you change values, you will leave this checkbox blank. Try changing values to see what happens. Other two ways of highlighting negative values will be shown below. Select as shown in the image, and in “Symbol”, select “None”. Click on “OK” and check results. Excel, as a tool that was first used for accounting, makes a significant difference between negative and positive values. That is the reason why you can set a special format for negative cells. I have copied the previous example in the file just next to previous examples, in order to use them for showing how to apply custom formats. From the drop-down menu, where it in most cases says “General” – select “More number formats…” which is the last option that you will see. Select “Custom” and you will see the screen like the one above. Also, you can define spaces if you want.